For many couples, the big decision on Valentine's Day is where to make the dinner reservation. 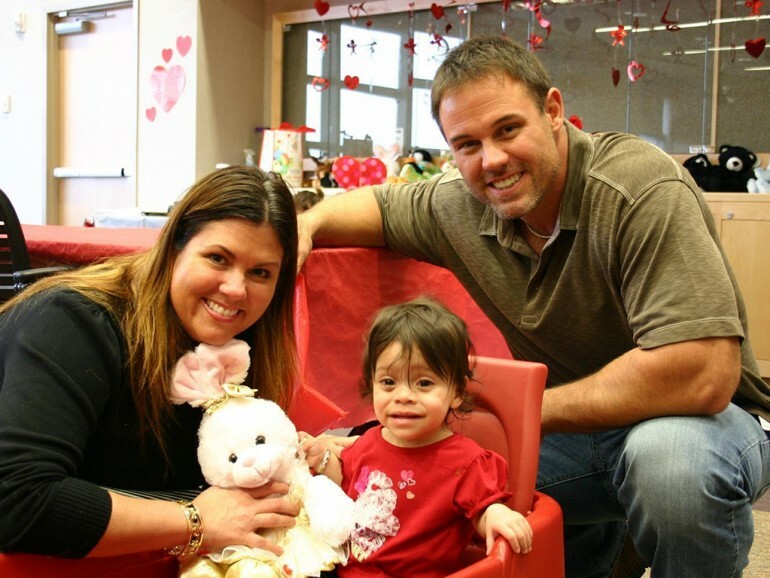 But for Mike and Nicole Alstott, there's no decision to be made at all. They have a reservation each year at All Children's Hospital - with a special date designed to bring smiles to kids and families. For the fifth straight year, the Alstotts arrived at the Children's Auditorium to help young patients or their siblings create their own stuffed animals - complete with an array of outfits to choose from, a little rainbow star to make a wish on and place inside their toy animal, and a customized "birth" certificate for their new pal. The event, coordinated by Child Life and the ACH Foundation, brought dozens of patients and their parents streaming into the auditorium. Mike and Nicole were waiting to greet them, offer assistance in creating the memorable keepsakes and spread a little Valentine's Day love to those in need of a boost. "Putting smiles on kids' faces is what Mike and I truly love to do," Nicole said. "And these kids are in the hospital beds every single day, so bringing them out is a total change of atmosphere. And giving them a chance to do something different - so they don't have to think about why they're here - is what we really why we do this." As a player, her husband made a living as a burly fullback known for his game-breaking, bone-jarring runs with the Tampa Bay Buccaneers. He began his charitable work as a player, with Nicole joining him from the start. And they have never stopped teaming up to help sick youngsters. After 12 years with the Bucs, the "A-Train" retired in 2007 as one of the most popular players in franchise history and, along with Nicole, started the Mike Alstott Family Foundation - dedicated, according the organization's Web site, to assisting others "in uplifting the minds, hearts and spirits of families and children." Along the way, the Alstotts have become a fixture at All Children's - whether making visits during Radiothon and Telethon fundraisers, accompanying college football players to meet patients during the week of the Beef-O-Brady Bowl, staging an arts-and-crafts event on Mother's Day, or their annual animal-stuffing party on Valentine's Day. Their impact was easy to see on Thursday. Nicole went right to work helping a 12-year-old girl, Giavonna, stuff a bear with handfuls of cushy fabric from a nearby basket. At the other end of the table, the man who pounded his way to is six Pro Bowls and a Super Bowl championship approached a 3-year-old girl, Beatrix, as she worked on her own little bear. "I'm Mike, how are you doing?" he said, extended a hand for a fist-bump. She stared at him wide-eyed, then waved tentatively at him with some encouragement from her mother, Beatrice. "Before you start stuffing, be sure to make a wish and put it inside," old No. 40 added gently. Beatrix took the little star, clasped it in her hands and bowed her head. Her 8-week-old sister, Diane, recently underwent surgery to place a shunt in her heart and is in the Cardiovascular Intensive Care Unit. "She told me she wished that we could take her and her little sister home soon," said Beatrice. Moments like that are why the Alstotts, who have three kids of their own, do what they do. "We just want to help take their minds off the reasons why they're here," Mike said. "My wife and I have been very fortunate, and we want to do what we can to help others - and teach our own kids the importance of doing that, too." For Nicole, the most fun part of the hour-long visit is simply visiting with the children and families. "It's really fun to sit down and interact with them - that's a big deal for us," she said. So is spending time with her husband this way on such a special day. "This is what means the most to Mike and me - giving back," she said. "We're together. We're with kids. And we go home after this to be with our kids. So when you think about it, this is a really nice way to spend Valentine's Day. It couldn't be any better."